Brother's most innovative, technologically advanced machine with revolutionary features is about to make its debut and you have an opportunity to reserve yours NOW! Stony Brook Sew & Vacuums is accepting fully refundable $ 500 deposits to pre-order the 2019 Next Generation Machine! But that's not all… In anticipation of our biggest machine announcement yet, we’ve got an introductory bundle to go with it. Customers taking delivery by September 30th, 2018 will also receive an Introductory Bundle Offer valued at over $ 5,000. 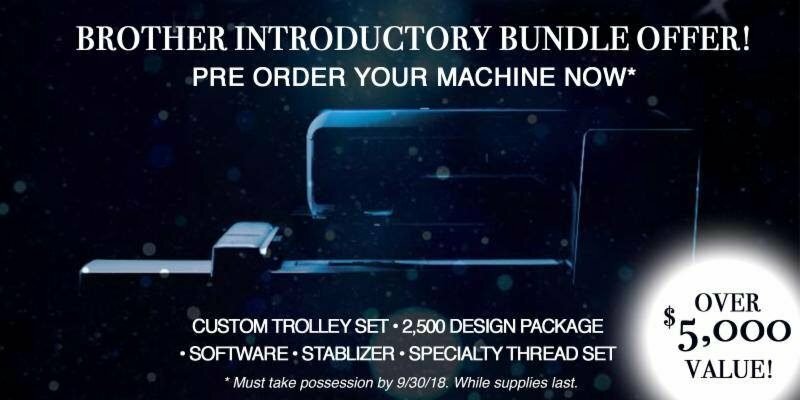 The introductory bundle includes a custom trolley set, software, 2,500 embroidery design package, specialty thread set, and stabilizer…almost everything needed to get started on that first project. Bundle offer is available while supplies last. We will meet or beat any price from an authorized dealer.